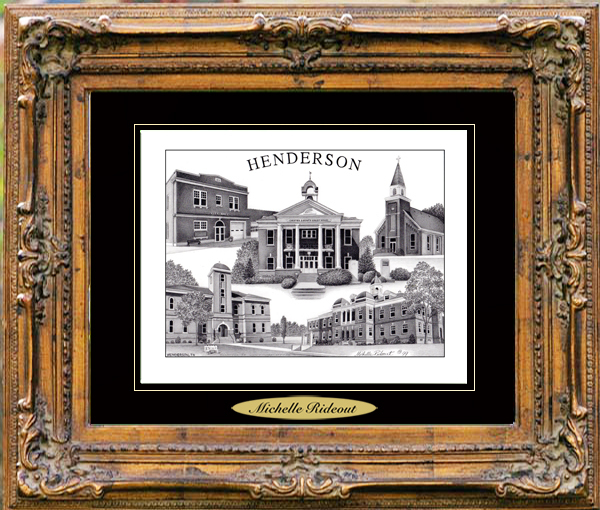 One of Tommy Thompson’s daughters, Michelle Rideout, created the pencil drawing of the town of Henderson, Tennessee. Henderson is the birthplace of country music legend, Eddy Arnold. The artist, Michelle Rideout, is known for her meticulous attention to detail in drawing and this one is a good example. Henderson, Tennessee, was founded in the 1850s as a railroad stop on the Mobile Railroad. Most of the town was built around the railroad, but a college caused growth as well. Freed-Hardeman University was founded in Henderson in 1907. Henderson has had several interesting natives who made an impression upon our nation. Sue Shelton White became one of the great leaders of the Woman’s Right to Vote Movement of the early 1900s. She later helped design the U.S. Social Security System under the Roosevelt Administration. Henderson’s most famous son is country music singer and songwriter, Eddy Arnold, who was born in Henderson in 1918. Arnold was inducted into the Country Music Hall of Fame in 1966.